A Black union worker was fired by Ryerson University’s administration while on medical leave, The Eyeopener has learned. Carol Sutherland, a union employee at Ryerson’s Equity and Community Inclusion office, was terminated from her position on Jan. 8. She said that after believing she was having a heart attack, she went to Michael Garron Hospital to get examined. She was told she was having a panic attack as result of workplace stress, she said. Sutherland said she had to go all the way to Thornhill for an independent medical exam with a particular psychiatrist recommended by Ryerson. She said her psychologist called Ryerson, informing them that this request would cause more stress and anxiety and asked if she could see a doctor close to her home. The request was ignored, she added. Following a 21-page report from the psychiatrist, Sutherland said Ryerson terminated her. “They disregarded what my doctor has sent, they disregarded everything,” she said. “They terminated me based on an independent medical exam, a medical exam that Ryerson forced me to go [to], and Ryerson said if I don’t go to that, I [would] be fired,” she said. Ryerson declined a request for comment, stating that human resource issues are addressed as confidential matters. “It is the expectation of the university that all Ryerson employees’ behaviour reflect the values and standards of conduct held by the university,” public affairs said in a statement. Sutherland said Ryerson sent a letter to her home saying she would be terminated if she didn’t meet with HR. She said she attended the Jan. 8 meeting and was told she was fired. She said she signed a contract guaranteeing a return to her home position as a customer client services ambassador at the ServiceHub on Jan. 14. “I called my union representative and she came with me. [HR] said ‘Carol you are fired, we are terminating your employment effective immediately,’” she said. “Effective immediately [means] my benefit is gone. My medication is $200. I couldn’t afford to buy my medication,” she added. 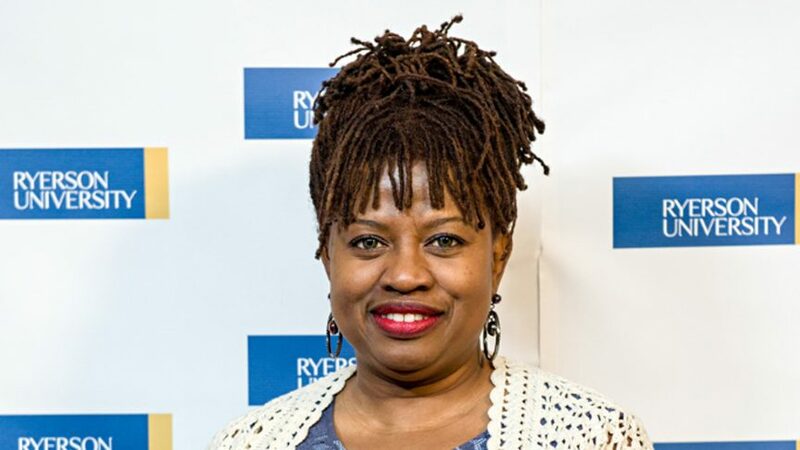 Sutherland was the founder of the Ryerson Black Faculty and Staff Community Network, an initiative that works to support Black faculty and staff members of the university. The group works to enhance Ryerson’s academic and cultural diversity, according to the Office of the Vice President Equity and Community Inclusion‘s website. Mandissa Arlain, Ryerson’s library technician and an executive member of the Ryerson Black Faculty and Staff Community Network, said Sutherland’s firing was unexpected. Arlain added that Sutherland had always selflessly supported racialized workers. “She understands the lived experiences of racialized workers. Those incidents and instances that some of us will inevitably face in this super polite society that publicly endorses messages of equity, community and inclusion, however, still seems to need some time to catch up to those noted ideals,” she added. Josh Lamers, the co-founder of Ryerson’s Black Liberation Collective (BLC), said Sutherland’s firing is a wake up call. “The termination of Carol is both jarring and awakening for some to what BLC Ryerson has always known, which is that spaces like the Office of Equity and Community Inclusion are implicated in the ongoing anti-Black climate on Ryerson campus,” he said. “Carol was well known for being one of the few Black staff at Ryerson who would actually open up her office to Black students and support in quite literally any [or] every way possible,” he added. The Eyeopener previously reported that Sutherland’s union representative went by the pronoun of “he,” instead they go by “she.” The Eyeopener regrets this error. My name is Sharon Folkes-Hall, and I have first hand knownlege about Mrs. Sutherland connective cultural support she willing give to students. I remembered the numerous days when I needed to talk to someone from Status Title and she was one of the supportive person that I asure that would open her door to listen to what I am saying, not what she think I should be saying. Yes, we do need more communty support people at Ryerson. I love Mrs Sutherland’s work culture connectiveness because it speaks from her heart passion to connect with students. In other news the same Human Resources Department that fired her just gave an award to their own Human Rights Office for their “good work”. This is the outcome of extream rasicam. Took the womans benifits and her job as well and for what exactly??? Smh you people are inconsiderate ans rasict beyond beliefe. She needs to be rehired. She was an amazing asset to this cause. Terminating her was wrong as hell. You’re jumping to the conclusion that this is the result of racism with zero evidence supporting it. Based on the article itself, she was fired while on medical leave, and I believe it is against labor laws, but nowhere does it say she was fired because there was racism issues, thus she could have been white and could have had the same thing happen to her. Complain about mismanagement, not racism. Stop pointing fingers and quick to assume with zero evidence. They did yhr same thing to me. No warning, no issues, never saw it coming. New management so they decided they needed new staff. I think the headline is bias and distorted! Why black employee, why not simply Ryerson employee. You are vocal about racism but playing the race card when required! This is not journalism. This story shouldn’t have run. There is too many details missing. More time should have been invested in researching what happening leading to the termination. There is too many gaps, this store should be rerun or edited to reflect true investigation to ensure either Ryerson or Carol were not misrepresented. Lmaoo @Sheri please tell me this ain’t the same Sheri who was with her man spending students money on that rsu credit card? CAROL SUTHERLAND contact information is still on Ryerson’s website. Headlines are there to grab your attention. “Black staff member” got my attention in an era of Twitter, Instagram and Facebook. “Male black shot and killed.” or “Suspect is described as black.” It surprising how people do not see this as racist as every black person cringes when they see, hear or read these descriptions in the media. So no one should be offended by the use of the word black in the headline, that’s just how we are described. I have known Carol for several years before she even began working for Ryerson. She has always been a champion of the underserved in the black community. Her dedication and service has lead to many awards. Her style and ability to connect with people lead me to refer to her as the Oprah Winfrey of Canada. I was saddened to learn of her dismissal, but not surprised. In institutions like Ryerson people of colour are terminated in times of “house cleaning” as they say. I have seen it my previous job in retail and I have seen it in the hospital setting. People of colour tend to disappear in time of restructuring. It’s actually fascinating that in the years of plenty (Spending by big corporations) they can find qualified black people to fill various even executive positions, but as the lean years arrive those same positions are no longer filled with black faces. For a lot of us we tuck our tails between our legs and pray that we are not next to be terminated. As more pressure is applied a lot of us just leave for less rewarding jobs. We all don’t leave quietly though and I applaud Carol for saying this behaviour will and should not be tolerated. I hope her tenacity see her through this with a more positive outcome. I stand by Carol. I have known this woman for many years. She always would tell me how she has fun helping students at Ryerson, and getting to know them better personally. She would always tell me how same student came back to see her and they are doing a lot better then before they first came. I thought Ryerson would give her face after all she has done for people but to be backstabbed and put in to a dark place after all the things she did. It’s disgusting, disrespectful, and degrading. Ryerson Universities attitude towards its non-white staff is disappointing to say the least. But, I guess Edgar’s legacy lives on in the practices of its Managerial classes. Carol’s firing is a disgrace. As a former staff member, I believe that Carol played an integral role in the retention and recruitment of other racialized staff and faculty. She would always greet everyone with warmth and point us to helpful resources. She demonstrated strong leadership skills. It is ironic that Ryerson prides itself on being a supposed Top Diversity Employer. What a farce! Anti-Black racism exists there and this is obscured by the Equity Office staff who maintain the status quo and are complicit in the oppression of racialized others. Ask hard questions about the so-called Equity staff who allowed this to happen. Hopefully, this debacle will result in a lawsuit and much-need bad publicity for this so-called Top Diversity Employer.